For those who haven't picked up on this yet, I have "a crush" (in the words of Angie Horn-Andreu) on Philippians 2:5-11, that poetic gospel hymn. It has come up in my thinking lately as naturally as butter on popcorn or milk with Oreos. It has permeated throughout all of the gospel stories I read and reflect on. A cursory reading, though simple, is sufficient: Jesus being God, showing us what God is like, became a servant even to death which lead to vindication. But there are other elements we might consider. We might consider, for example the context into which this text entered. Paul is writing to people who are under Roman rule, people who might be very familiar with the concept of "being in very nature God" as being applied to Roman Caesars. Caesar might have been their first thought rather than any concept of the One True God of Israel, especially if they're gentile Christians. They would have thought of Caesar who does indeed "consider equality with God something to be exploited," something to be held over people in order to keep them in their place. Perhaps the language of death on a cross would spark into the mind of the reader images of utter shame. Perhaps Jesus is going from the top (Caesar=honor) to the bottom (cross=shame). Perhaps the language of exaltation, tongues confessing and knees bowing, would have brought images of Rome to mind. Perhaps at the statement "...and every tongue confess that Jesus Christ is Lord," those ever familiar words "Caesar is Lord" would have been ringing in the ears of the reader or hearer. Thus Paul brings this hymn to mind not only to affirm Jesus as servant-God but also to contrast Jesus with Rome. Paul is flipping upside down, for people who would probably not have been considered honorable by the society, the whole concept of honor and shame to raise the question: who would you rather follow? 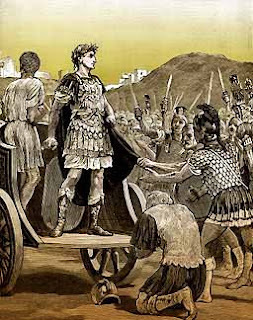 Caesar, who exploits his power and holds his 'divinity' over his subjects by the sword, or Jesus, who is exalted by his obedience to God and his humble suffering in solidarity with his people? Should I emulate the way of wealth and power or humility and service? Violence and exploitation or Peace and solidarity? This is how I have understood this text lately (though I should mention that I still havn't researched the validity of this perspective, I've never even heard anyone else point it out). I have been content with my interpretation thus far but last night at class someone pointed out another possibility which he read in a book unknown to me by James Dunn. Paul, in other books and passages, offers the motif of Jesus as the "new Adam," redeeming the corruption of Adam's disobedience in all mankind though his own obedience (Romans 5:12 and 1 Cor 15:22). As my friend from class suggested, perhaps that motif is alluded to in Philippians 2. 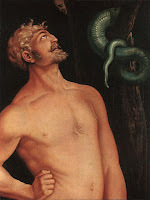 "being in very nature God [or perhaps "in the image of God" as Adam was before his corruption], did not consider equality with God [that tasty offer from a certain serpent] something to be grasped [or snatched from a tree]..." Do you see how this suggestion makes sense? Adam was in the very nature God but he saw equality as something to be grasped, he took from that forbidden tree and he ate. Where Adam was disobedient, seeking eternal life, Jesus was obedient even to death. Whereas Adam was created in God's likeness, Jesus comes in human likeness. I am wrestling with both of these suggestions as I am considering the possibility that both of these interpretation are "correct." If this is indeed a hymn then the loftiness of the language lends itself to a plurality of interpretations. I never thought of that either. I agree that there can be a plurality of interpretations.